If you've been reading my blog for a while, you might know I've been traveling quite a lot, especially my monthly visits to Sweden before Daniel moved here. If you're flying budget airlines and you're a cheapskate like me, you'll be traveling with only hand luggage. Everything has to fit into one 56 cm x 45 cm x 25 cm suitcase and it can't weigh more than 10 kilos, and of course you need to save some space in your bag in case you do some shopping. Which, in my case, is likely. 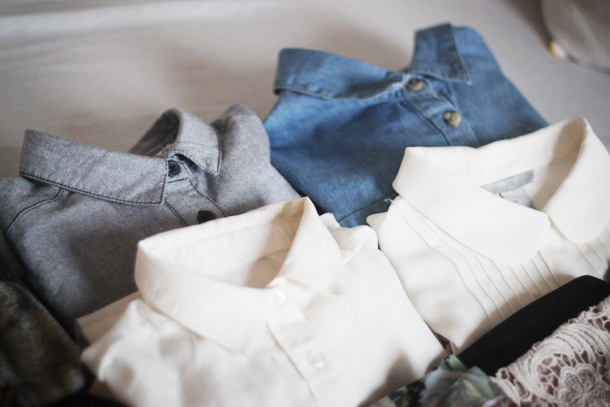 Four button-ups: A blue one, a denim one and two white ones. 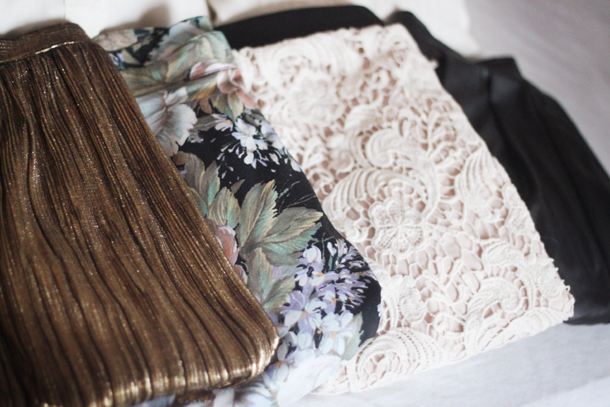 Four skirts: A gold one, a floral one, a lace one and a leather one. All in neutral colors so they'll match with everything else I'm bringing. Three sweaters: My wolf sweater and Batman sweater to protect myself for the Swedish cold, a fancier pink one. Two necklaces. Notice how every item I brought can be worn with every other item I brought? Technically it should make for 76 different combinations, not even counting accessories. Whoah! I could wear a button-up with a skirt, the next day I could wear the same but add a sweater. Or just the sweater instead of the shirt. Or a different skirt. You get the point. I only picked fabrics that can deal with some serious suitcase action, so I don't ever have to iron anything. Think about what items take up the most space in your suitcase and wear those to the airport. You can always take 'em off once you've passed security. Did too much shopping on your trip? Layer like you're an Olsen twin, girl. I roll everything up to minimize creasing and save space. Oh, I hear you on packing light! I'm in a long-distance relationship and have this down! I love the phrase "layer like you're an Olsen," too -- very clever. 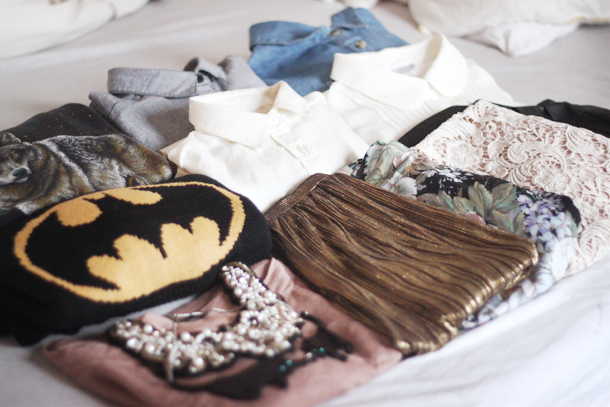 I love all of your clothes so much, haha. love everything! 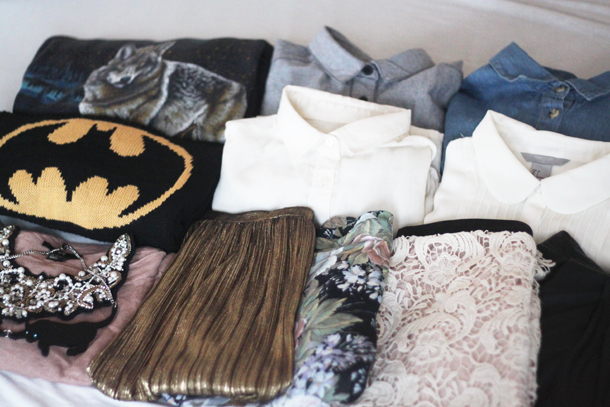 especially the lace skirt and the batman sweater! and this post is really helpful, big thanks! Such good advice! <3 I am a speedy packer, but always bring SO much stuff. I never have enough room for shopping - it's so annoying! I'm going to Europe for 3 weeks this spring so I'm definitely saving this post! This is really handy advice! And probably quite relevant to my life this year so thank you! I travel a lot and your tips are really useful, thanks :) Especially love the "layering" tip - I totally do this on the airports... Thanks again! this is so amazing. I always try to pack like this for my trips and somehow always fail. love having these visuals to inspire me! thanks for the secrets! Can you tell me where you got your gold skirt? I've been trying to find something like that for forever. Also, the white shirts. I've never managed to find any kind of shirt that doesnt need ironing upon arrival.